I'm a bit late on these, but it took me a while to find a display at CVS. Nichole posted her swatch and comparison for Rich weeks ago. I saw them at Target a little while after that, but I'm all about the CVS coupons and knew I could get a better deal there. 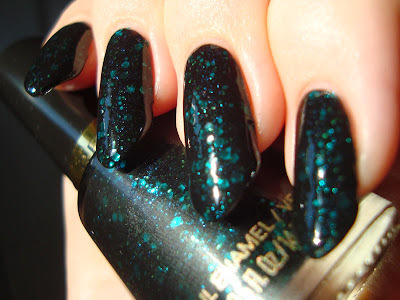 I originally bought just three of the four new polishes, but I wound up going back for Seductive too. I also got one of the lip glosses, called Embellished. I was going to swatch that too and include it in this post, but I have a vitamin D crack on one side of my mouth, so lip swatches will have to wait. This is just a hunch, but I don't think these new shades are LE. I could be wrong, but I have a few reasons. For starters, the shade name stickers have numbers on them. Revlon doesn't number their LE's. The display doesn't say "limited edition" anywhere either, and Revlon's generally pretty good about that. They also tend to make new Gucci Westman shades core...though not always. We'll see soon enough. Target's usually quick to reset their core displays, so I'll be eyeing the Revlon core closely to see. 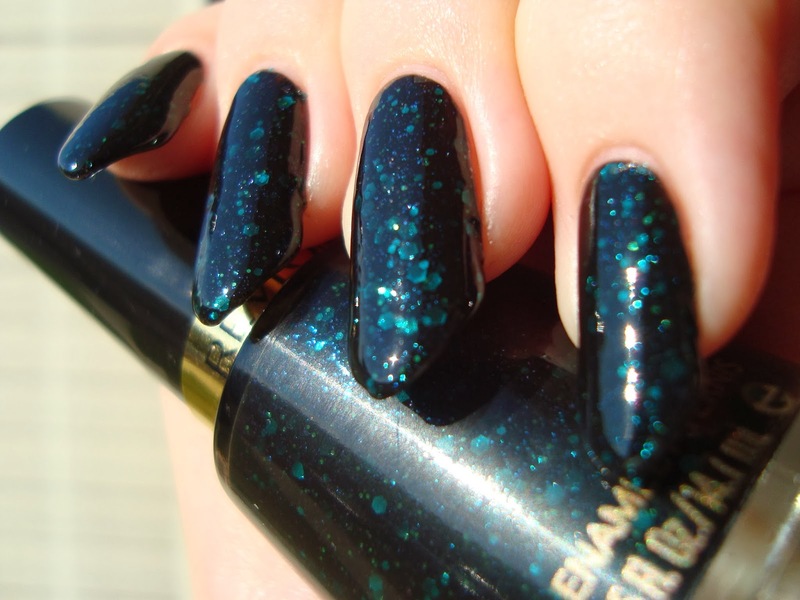 Elusive has a black crelly base with a blend of medium teal hexagonal glitter, tiny green glitter, blue microglitter, and a little bit of purple shimmer too. I kinda wonder if Elusive is named for its purple shimmer. You can't see it at all sometimes, but then in the bright sun (like the photo above), there it is. There's a lot to love here, if you can overlook the hassles involved. I wore it for a few days and wasn't bored at all. Zeus got a bottle too, even though I warned him about the issues he might have with it. He said it was so pretty that he didn't care and wanted it anyway. Can't really fault him, can you? Say it with me, people..."ewwww". Un-hot. Lumpy. The sunlight really shows off the ick factor, but I guess it wasn't that bad in lower light like the photo below. 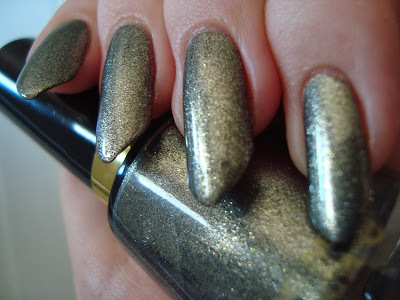 I wound up adding two more coats of Gelous and another of Seche Vite. Thirsty! 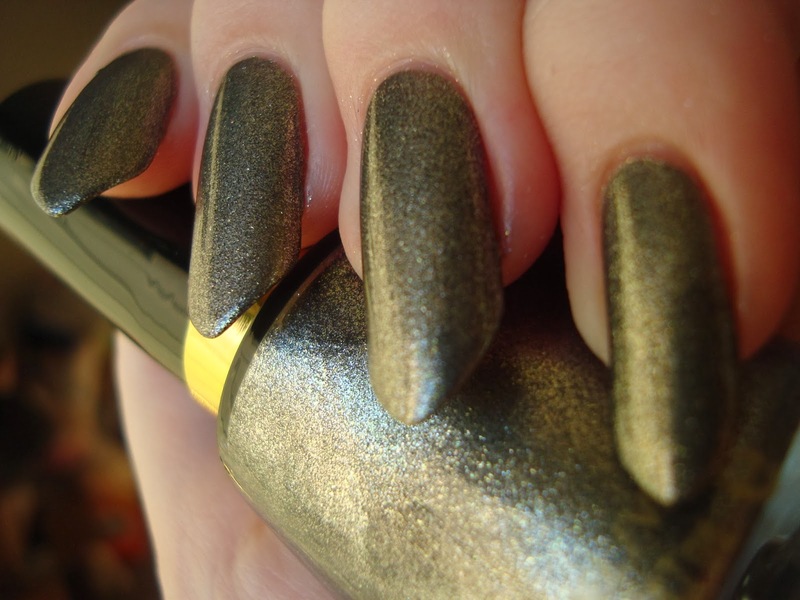 Rich is a complex green-toned pale gold foil. I'm cheating a little by calling it pale gold. It's kinda too many colors to describe. 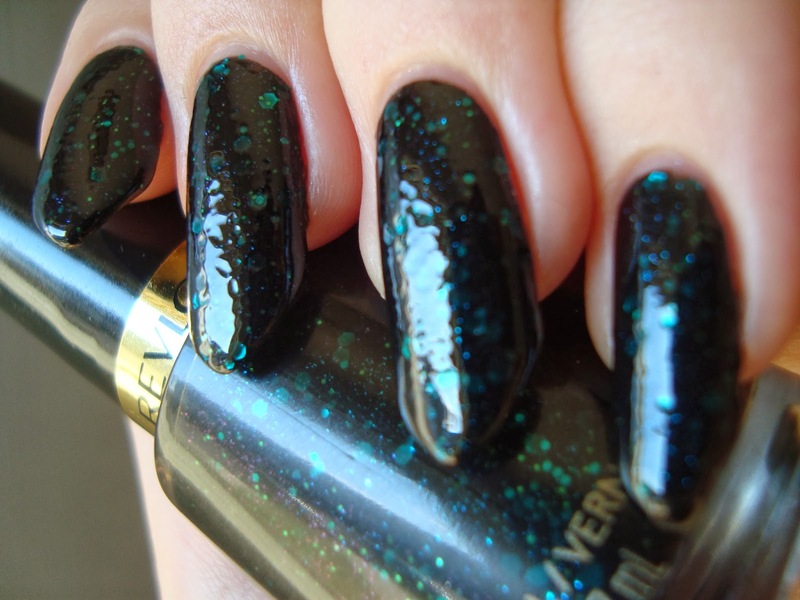 This is three coats and like all foils, the cleanup will be tough if you get it on your skin. 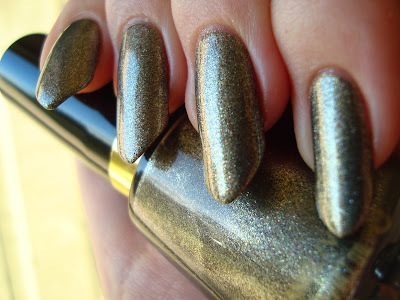 Nichole compared it to Urban Decay Addiction and OPI Number One Nemesis, but found that it's not an exact dupe for either. I'll be comparing it to NYC Flashback soon. For now, it's on its own...and it's lovely. There's a 'darker around the edges' quality to it. I love polishes like that! In lower light that effect goes away and a different kind of depth comes out. It looks almost silver at times. So pretty! This is the only one in the collection that I mattified, and wow does it look good this way! 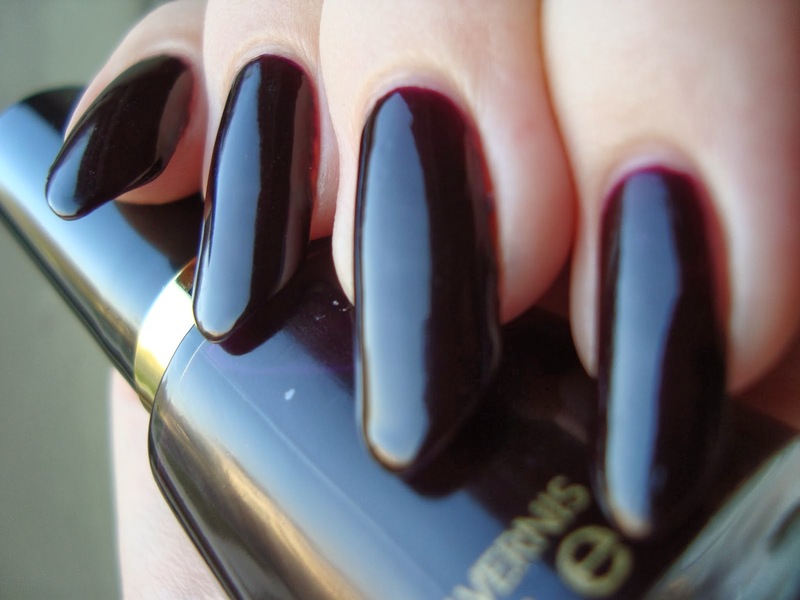 Seductive is a deep violet crelly. So glad I went back for this one! 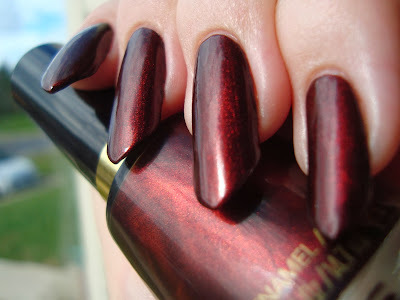 It's vampy and deep and so flattering for a pale thing like me. I can see it looking black if you're darker though. 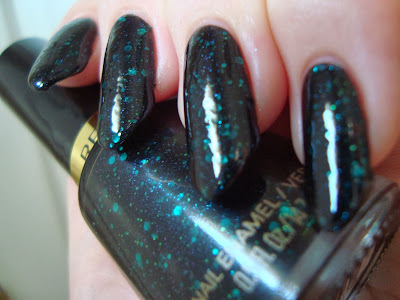 Because it's a crelly, it'll take at least three coats for opacity on any nail length. This is three, but I only put two coats on my right hand and it really wasn't enough. I wound up getting 'stuck' in it for a whole week, because of the flu, so I can report that it wore pretty well on me. No chipping, but I did have some pretty bad tipwear on my right hand. Maybe it was because I only used two coats. Dunno. I have a hunch that it *might* be sheer enough for sandwiches, but I didn't try it out. 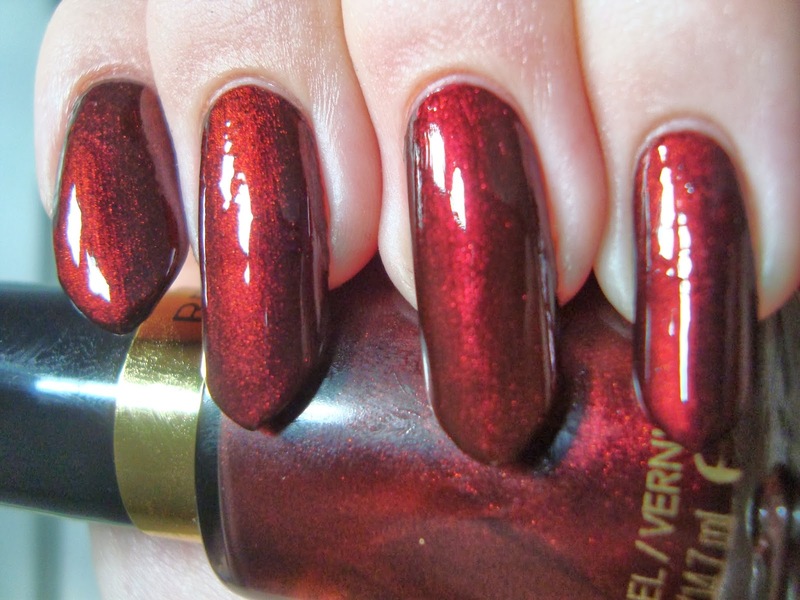 Divine is a blackened red shimmer. The formula on this one is suuuper thick and almost a one-coater, but I wound up using two. 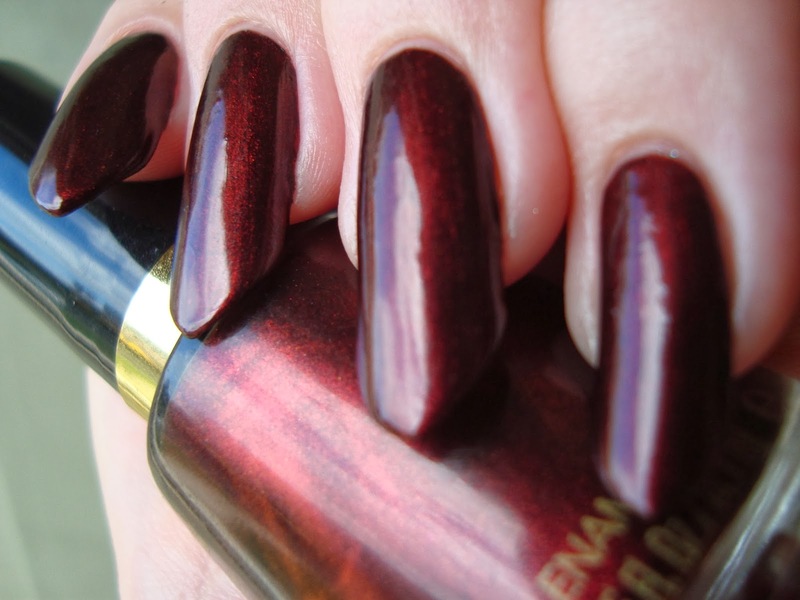 Something about the Revlon Nail Enamel formula doesn't like me. They tend to bubble. I got at least a tiny bit of bubbling with all four of today's polishes, but Divine is the only one where they're an issue. They kinda ruin it for me. They're not glaringly obvious, but they're noticeable. It's a shame, because Divine is gorgeous. I'm gonna give it another try sometime, sponged on, but I'm not sure if it's a keeper for me. Of course, it's not unique. In fact, it's a near-dupe for something more expensive. See how my ring finger is a slightly cooler red and bubble-free? 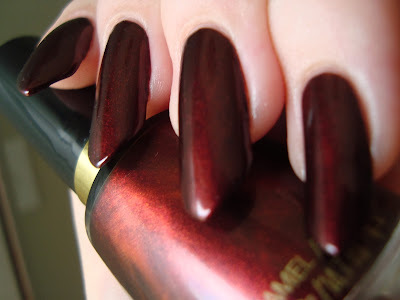 That's OPI Royal Rajah Ruby. I finally got around to buying it. It's up around $20 now, since it's become kinda HTF, but I had a lot of eBay Bucks. 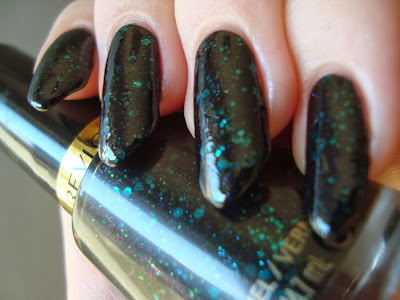 If you're lemming RRR and Revlon Nail Enamels don't bubble on you, Divine might be perfect for you. Bottom line: All gorgeous! This line bubbles on me as a rule, but it isn't noticeable in any of these shades except Divine. I wouldn't say any are must-haves, but Elusive is fairly unique and worth getting if you're willing to put up with its quirks. The rest are somewhat dupey, but if the formula works for you they're good alternatives for more expensive polishes. I know I'm not alone in the Revlon bubbling problem. Does it happen to you too? I wish I could figure out why it happens. It can be a bit heartbreaking to find a gorgeous shade and then have it froth up as it dries. Luckily I don't usually have this problem with their other lines. Thanks for the swatches! Revlon does not bubble on me, but OPI chips like no one's business. Revlon Top Speed is hit and miss though, but I seem to have good luck with the original line. That's so odd! It's the opposite for me on all counts. 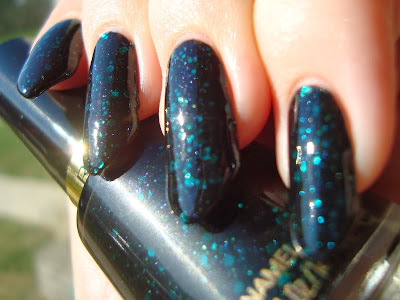 OPI wears beautifully on me most of the time and Top Speed almost always goes on just fine. I know I'm very acidic. Wonder if you're alkaline.